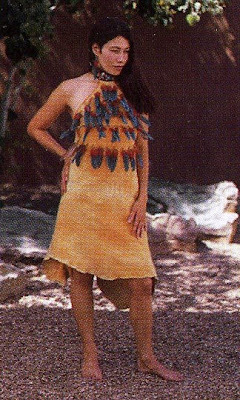 I was going through some of my old materials from my dissertation research, and I came across this short article on fashion written by Lloyd Kiva New as an introduction to the pamphlet for Native Uprising - the successful Native fashion collective based out of Santa Fe in the 1980s and 1990s. New had worked in the fashion industry in the 1940s and 1950s, and championed its inclusion in the curriculum offered at IAIA. A few years ago a well known New York designer, decrying the vagaries of fashion, declared: “Fashion is spinach!” And while everyone knows that the world of fashion is indeed strange and capricious, it nonetheless represents one of the most basic and compelling of artistic impulses, from the simplest to the most complex of cultural enclaves – each has engaged in one form or another in the art of personal adornment. It is axiomatic: Who one is, is most visibly proclaimed by what one wears. American Indians are no exception. As far back as 4 to 5 thousand years ago some Indians are know to have made and worn beads, gorgets, earrings, necklaces, and pendants; even before they had invented pottery, ceremonial equipment, the sculpting of animal and human effigies or demonstrated any serious development in the pictoral arts. More recent historic times reveal the wearing of painted robes, woven blankets, quilled, beaded, and embroidered dresses, moccasins, hair ornaments, elaborate feather headdresses and the ubiquitous spread of both secular and religious tribal costumes of great beauty and distinction.